Yesterday I came across the work of Muel Kaptein who is a partner at the international assurance and advisory firm KPMG and professor in business ethics and integrity management at RSM Erasmus University. Interestingly KPMG have as their corporate motto ‘cutting through complexity’ which I do kind of like, but then on the other hand, perhaps it indicates that for KPMG, complexity is something negative to be eradicated, rather than understood and utilised in order to develop living, sustainable and resilient organisations. But anyway, through KMPG Kaptein has published a very interesting report Steered by Sensitivity – A plea for more intuition in the board room. This report has many interesting interviews, and explores the role intuition plays in decision-making at board level. In this instance, intuition is a concept which is being related to feeling, i.e. the common sense use of the word. The report explores how ‘rational’ considerations are only acceptable in decision making, and the fear of being wrong or making a mistake obviously contribute to this situation. However, what is interesting is that when approaching not just complex problems but wicked problems, perhaps we need to use other mental faculties, intuition of which is one. An extremely important highlight in the report for me was the discussion on framing. This is the way in which we construct our mental models of problems, and although framing is often discussed in the business world, often it is only given lip service with people thinking that they are taking framing into account in the decision-making process, but in fact are suffering from an overload of framing and mis-perceptions and mis-conceptions. This leads me back to our holonomic conception of intuition, which is seen as something separate from ‘feeling’. It is fascinating for me to read about the way in which Einstein discussed his own mental processes. Of course psychologists would probably say that these introspections were of no scientific value, but I think we have to take his insights seriously. Einstein of course worked with mathematics (thinking) but the mathematics were telling Einstein something deeper about the structure of the universe and the structure of reality. These insights could not be modelled, and could not be codified. Einstein had a scientific intuitive faculty in which he could comprehend complexity. I think that this was the same cognitive faculty that Taiichi Ohno, creator the Toyota Production System was tapping into when he comprehended the notion of ‘flow’ in production lines (See my recent article Complexity, Flow, Mindfulness and Holonomic Thinking). It was Ohno who told his own managers not to codify their methods of working, since the deep knowledge existed in their intuition, and any attempt to codify would mean that this knowledge would get lost, diluted and misunderstood if written down. 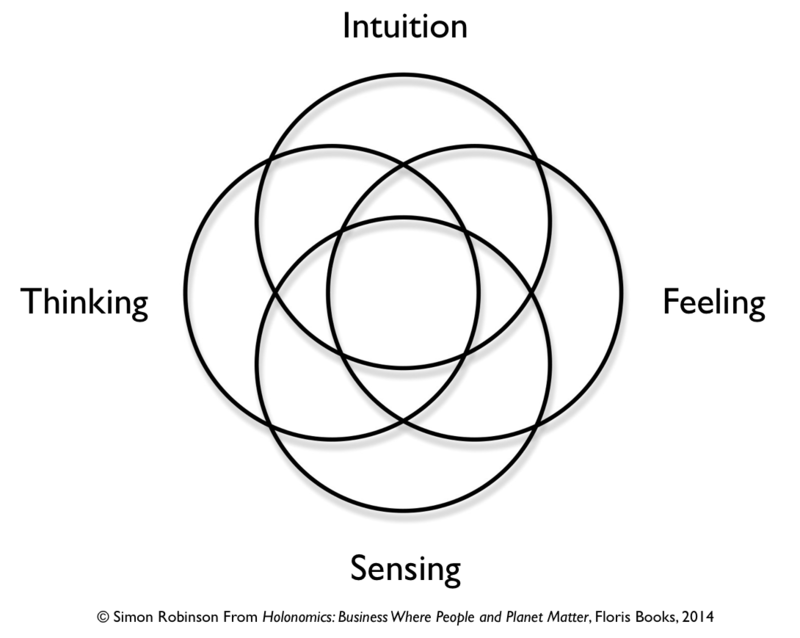 What I also think is interesting, is that if we develop these two different aspects of intuition in people, especially those in business whose decisions have monumental impact and ramifications for people the world over, then their feeling for the complexity of the systems in which they are impacting on will improve for the better, and they will better be able to connect with the outcomes and ramifications too of their decisions. It no longer becomes a decision about data, and financial benefits. The decisions move from purely quantitative to qualitative, and when we understand the qualities of life, we then have the ethical dimension so desperately needed in business and organisational life. I am grateful to Bert van Lamoen for pointing me in the direction of the work of Muel Kaptein. Bert contacted me via Transition Consciousness, as have many others. I am always delighted to hear from people who have enjoyed reading my articles, and I have had many rich conversations as a result. I always welcome comments and emails, and I always reply, although there can be a slight delay during busy times with work commitments.